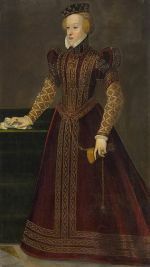 Barbara of Austria is determined to be the dutiful second wife of Alfonso d’Este, the Duke of Ferrara. 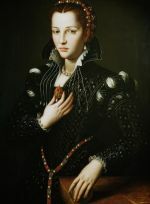 Unfortunately, the court rumors surrounding the death of his first wife, Lucrezia de’Medici have piqued her interest. But is the Duke the one who killed Lucrezia? What will be his reaction to Barbara’s questions? 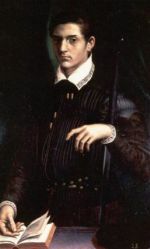 Elizabeth Loupas uses Robert Browning’s poem, My Last Duchess, as the context for her historical tale of Barbara and Alfonso’s marriage. I’ve always liked Browning’s poetry but Elizabeth Loupas brings new life to it. The vivid historical details are intricately interwoven with the mystery behind Lucrezia’s death. However, what makes THE SECOND DUCHESS truly stand out is the inclusion of Lucrezia’s perspective. Elizabeth Loupas creates a ghostlike condition called “immobili”, a condition in which Lucrezia can see all that is occurring but she is unable to physically interact in any way with the other characters. Barbara is a fascinating heroine as well. Barbara strives to follow all the rules of deportment and yet her curiosity is insatiable. Her control even in some of the most awful situations is stunning and provides a vivid picture of just how complex and tricky court life could be. Quite frankly, Barbara’s ability to understand some of Alfonso’s actions and abusive behavior portrays the true status and worth of women during the Renaissance time period. Alfonso’s role is more troubling. Is he just a man of his time or something more sinister? Elizabeth Loupas does a phenomenal job at bringing her characters and the time period to life in THE SECOND DUCHESS. THE SECOND DUCHESS is simply outstanding. Elizabeth Loupas’ tale engages the imagination while providing a stunning portrayal of women in Renaissance Italy. Bravo!